With Admiral Mainsail Furlers you can furl and unfurl your main sail without heading to wind. Electric and hydraulic mainsail furlers are custom produced upon order. The mainsail furler rolls the mainsail around itself inside the mainmast. NauticExpo offer different mainsail furlers including electric and hydraulic models. The primary function of the mainsail furler is to roll the mainsail within the mainmast. When tension is applied to a cylinder within the mast, the mainsail is furled by rolling around itself. 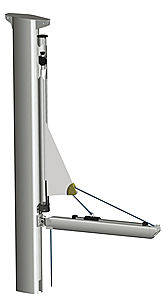 Some furlers use small electric or hydraulic motors for automatic furling. These are used primarily for large mainsails. Choice will depend on the size of the sail and of the mast.